It seemed as if the banks and other firms got a $700 billion bonanza and the American taxpayer got the shaft. But along came this straight-shooting Harvard professor to oversee the bailout, someone who pledged to look out for the middle class and brought a sense of sanity to the economic crisis. For this we give her our top honors this year. There are many ways to become our Bostonian of the Year. You could be one of the nation’s preeminent bankruptcy scholars, and a tenured professor of law at Harvard University, and a talking head for Frontline specials and Michael Moore’s latest documentary, and a leading voice decrying the human cost of the current economic morass, and the chairwoman of the Congressional Oversight Panel monitoring the Troubled Assets Relief Program, the TARP that covers a multitude of financial sins. The panel keeps an eye on how the nation’s banks have spent the taxpayer money shoveled into them in the fall of 2008, as well as the destination of the rest of the $700 billion allocated by the government when the economy seemed on the verge of swallowing itself whole. This can set you at odds with secretaries of the Treasury, various ambitious legislators, and laissez-faire economic fundamentalists. Elizabeth Warren has done all that, and has done as much to earn the title Bostonian of the Year as has anyone who was born and raised in Oklahoma. But she has one even more essentially Bostonian accomplishment on her considerable resume -- she once shut up basketball fans in Philadelphia. One night about two decades ago, she and her husband, Bruce Mann, who also teaches at Harvard Law, were attending a game between the 76ers and Warren’s beloved Houston Rockets. (Warren taught at the University of Houston when Hakeem Olajuwon played for a Cougars team memorably dubbed “Phi Slama Jama” for its dunking prowess.) “So Elizabeth is up, cheering, yelling at the ref,” Mann recalls. “And the crowd around is getting kind of, well, restive. They’re saying, ‘Hey, lady, you’re not from around here, are you?’ ” Finally, one of the burlier gentlemen in Warren’s section inquired why she was so passionate about the Rockets. Warren explained her background in Houston. He then determined to quiz her on her bona fides. Who was the coach of that team, he asked her. Guy V. Lewis, she answered. What was his trademark, he asked her. He carried around a checkered towel, she answered. Satisfied, the man sat down and Warren went back to being loud. Gradually, the crowd began to get audibly impatient with her again. Suddenly, the large gentleman stood up and addressed his colleagues. 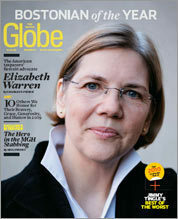 You can understand that moment when Warren, 60, talks about the political heat inherent in the position she now holds. The great cause of her life has been defending middle-class Americans against what she calls the “tricks and traps” the nation’s financial institutions devise to separate those citizens from their money. She was talking about the dangers of the subprime mortgage binge long before the bubble finally popped. She is equally scornful of how the credit card companies bury their real brigandage under a blizzard of sub-paragraphs and dependent clauses. And ever since last November, when Senate majority leader Harry Reid persuaded her to take charge of the Congressional Oversight Panel, and even though she is aware that the panel does not have any real enforcement powers, Warren has become a burr under the saddle of official Washington -- plain-spoken, invariably polite, intolerant of business-school persiflage (“That’s a word we don’t use enough!” she exclaims), and utterly contemptuous of conventional wisdom. These are not qualities that endear you to the courtier set inside the Beltway. Warren got in the face of then Treasury secretary Henry Paulson and stayed there to the point where Paulson’s staff began sniping at her in the newspapers. She gently -- but relentlessly -- prodded Paulson’s successor, Timothy Geithner, until Geithner dragged himself before the panel to testify. In short, she has been accused of exceeding her mandate, mostly by people who would rather she not have a mandate at all. She has been called an ideologue -- mostly, it should be said, by other ideologues. Warren, simply, could not care less. “They were tired of me before I started,” Warren says with a laugh. “I am not looking for jobs with these guys. My job is not to get out there and kowtow to these guys so they’ll be nice to me. I figure this is the one time I will have a true public-service job. I’m going to do everything I can to execute this job the way it ought to be done. If there’s some politician, Republican or Democrat, who has a problem with that, I just don’t care. Perhaps the most dissonant criticism leveled against Warren is that she simply is another Harvard elitist come down from the mount to lecture the rest of us on the way the country should be run. On the wall of her office, framed, is a Pennsylvania newspaper advertisement from August 23, 1882, announcing that Sheriff Joseph Frankenfield would be auctioning off a farm that day, a property owned by folks on whom the bank had foreclosed a mortgage. Gradually, almost imperceptibly, a gentle twang enters Warren’s voice when she talks about this ad. “If you don’t talk about families,” she says, “then it’s easy to disembody subprime mortgages and asset securitization and unemployment rates without remembering that every one of those numbers is a million families.” This is what the guy meant in the basketball arena some 20 years back. The lady has history. In Norman, Oklahoma, it was the last house on the last road on the far edge of town. Behind it were wheat fields that extended to Texas, or to the Pacific, or to Oz, as best as you could tell from standing in the yard. 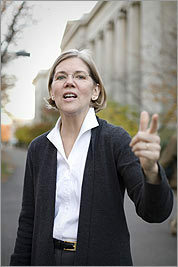 Elizabeth Warren grew up there, a caboose of a child with three much older brothers. “One was huge and the other two were mean,” she recalls. “I was 30 before I realized, you know, that I probably was an accident. These things just suddenly hit you one day.” Eventually, her father wound up as a maintenance man in an apartment building and her mother did catalog sales for Sears. Warren was something of a local prodigy, a state champion debater who graduated from high school at 16. One day, having saved up her baby-sitting money, she went to the local convenience store and took out money orders totaling $50 to apply to two colleges -- George Washington University and Northwestern -- to which she thought she was most likely to get a debate scholarship. She enrolled in the former but left after two years, when, at 19, she married Jim Warren, an engineer with NASA whom she’d been dating since she was 13. He was in Houston, working on the Apollo program, and Elizabeth transferred to the University of Houston to finish her degree. Eventually Jim’s work took them to New Jersey, where he was working on the country’s antiballistic missile program. Spurred by some of the people who had been on the debating team with her, Elizabeth enrolled in law school at Rutgers University. In 1976, she had a JD and new baby and few prospects. She taught in the law school at the University of Houston and, subsequently, at the universities of Texas and Pennsylvania before landing at Harvard in 1995. But Warren stumbled upon her specialty at her first full-time teaching job in Houston. In 1979, a new code of bankruptcy law went into effect, and Warren shared its details with the students in her first bankruptcy class the next year. Her interest was piqued. “I taught it like a Final Jeopardy question,” she recalls. “If this is the answer, what must have been the problem that people thought this fixed?” She teamed up with another law professor and a sociologist, and the three of them went into the field to study what was happening in the nation’s bankruptcy courts. Over the past two years, in its near-collapse, the financial services industry began to smack not a little of the rigged wheel, and its impact on the lives of American families -- particularly as seen through the prism of the subprime mortgage fiasco -- appeared to be dire. The issues on which Warren made her career exploded into the national consciousness. She became a sought-after expert, debuting as a pundit -- a word that makes her roll her eyes and moan -- on the Dr. Phil show. And she minced no words. “More and more middle-class families realized that what they were experiencing was not unique to themselves, that there were larger social trends,” she says. “And I also think there comes a point where people get tired of hearing the same old stuff from the kind of media machine the financial services industry has been pumping out. Then, one day, while Warren was barbecuing with students, Harry Reid called and asked her to take on the TARP oversight job. “I’ve really been talking about the same set of issues for a long time, but I was under the radar, and that was OK with me,” she says, the twang thickening just a bit, as though her voice had been aged in oak. “I don’t know, but I think part of it was that the world changed. What was a boring and obscure issue suddenly moved front and center.” And, when it did, she was there, with her history and all that, looking faceless forces squarely in the eye, speaking plainly to persiflage, and, in her own amiable way, drowning out the faint, distant voice of Sheriff Frankenfield’s auctioneer. Charles P. Pierce is a staff writer for The Globe Magazine. E-mail him at cpierce@globe.com.